Particle physics is a branch of physics which studies the nature of particles that are the constituents of what is usually referred to as matter and radiation. In current understanding, particles are excitations of quantum fields and interact following their dynamics. Although the word “particle” can be used in reference to many objects (e.g. a proton, a gas particle, or even household dust), the term “particle physics” usually refers to the study of “smallest” particles and the fundamental fields that must be defined in order to explain the observed particles. These cannot be defined by a combination of other fundamental fields. The current set of fundamental fields and their dynamics are summarized in a theory called the Standard Model, therefore particle physics is largely the study of the Standard Model’s particle content and its possible extensions. Modern particle physics research is focused on subatomic particles, including atomic constituents such as electrons,protons, and neutrons (protons and neutrons are composite particles called baryons, made of quarks), produced byradioactive and scattering processes, such as photons, neutrinos, and muons, as well as a wide range of exotic particles. Dynamics of particles is also governed by quantum mechanics; they exhibit wave–particle duality, displaying particle-like behavior under certain experimental conditions and wave-like behavior in others. In more technical terms, they are described by quantum state vectors in a Hilbert space, which is also treated in quantum field theory. Following the convention of particle physicists, elementary particles refer to objects such as electrons and photons as it is well known that those types of particles display wave-like properties as well. All particles, and their interactions observed to date, can be described almost entirely by a quantum field theory called the Standard Model. The Standard Model has 61 elementary particles. Those elementary particles can combine to form composite particles, accounting for the hundreds of other species of particles that have been discovered since the 1960s. The Standard Model has been found to agree with almost all the experimental tests conducted to date. However, most particle physicists believe that it is an incomplete description of nature, and that a more fundamental theory awaits discovery (See Theory of Everything). In recent years, measurements of neutrino mass have provided the first experimental deviations from the Standard Model. The idea that all matter is composed of elementary particles dates to at least the 6th century BC. In the 19th century, John Dalton, through his work on stoichiometry, concluded that each element of nature was composed of a single, unique type of particle. The word atom, after the Greek word atomos meaning “indivisible”, denotes the smallest particle of a chemical element since then, but physicists soon discovered that atoms are not, in fact, the fundamental particles of nature, but conglomerates of even smaller particles, such as the electron. The early 20th-century explorations of nuclear physics and quantum physics culminated in proofs ofnuclear fission in 1939 by Lise Meitner (based on experiments by Otto Hahn), and nuclear fusion by Hans Bethe in that same year; both discoveries also led to the development of nuclear weapons. Throughout the 1950s and 1960s, a bewildering variety of particles were found in scattering experiments. It was referred to as the “particle zoo”. That term was deprecated after the formulation of the Standard Model during the 1970s in which the large number of particles was explained as combinations of a (relatively) small number of fundamental particles. 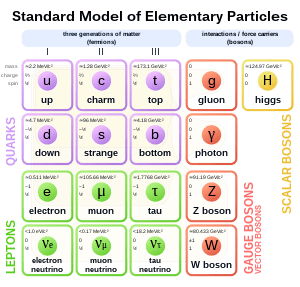 The current state of the classification of all elementary particles is explained by the Standard Model. It describes the strong, weak, and electromagnetic fundamental interactions, using mediating gauge bosons. The species of gauge bosons are the gluons, W−, W+ and Z bosons, and the photons. The Standard Model also contains 24 fundamental particles, (12 particles and their associated anti-particles), which are the constituents of all matter. Finally, the Standard Model also predicted the existence of a type of bosonknown as the Higgs boson. Early in the morning on July 4, 2012, physicists with the Large Hadron Collider at CERN announced they have found a new particle that behaves similarly to what is expected from the Higgs boson. Quarks and electrons were before this discovery not considered to be composed of other particles. However, with the discovery and verification of the existence of the Higgs boson, which gives other particles their mass, this belief has been changed. Brookhaven National Laboratory (Long Island, United States). Its main facility is the Relativistic Heavy Ion Collider (RHIC), which collides heavy ions such as gold ions and polarized protons. It is the world’s first heavy ion collider, and the world’s only polarized proton collider. Budker Institute of Nuclear Physics (Novosibirsk, Russia). Its main projects are now the electron-positron colliders VEPP-2000, operated since 2006, and VEPP-4, started experiments in 1994. Earlier facilities include the first electron-electron beam-beam collider VEP-1, which conducted experiments from 1964 to 1968; the electron-positroncolliders VEPP-2, operated from 1965 to 1974; and, its successor VEPP-2M, performed experiments from 1974 to 2000. CERN, (Franco-Swiss border, near Geneva). Its main project is now the Large Hadron Collider (LHC), which had its first beam circulation on 10 September 2008, and is now the world’s most energetic collider of protons. It also became the most energetic collider of heavy ions after it began colliding lead ions. Earlier facilities include the Large Electron–Positron Collider (LEP), which was stopped on November 2, 2000 and then dismantled to give way for LHC; and the Super Proton Synchrotron, which is being reused as a pre-accelerator for the LHC. Theoretical particle physics attempts to develop the models, theoretical framework, and mathematical tools to understand current experiments and make predictions for future experiments. See also theoretical physics. There are several major interrelated efforts being made in theoretical particle physics today. One important branch attempts to better understand the Standard Model and its tests. By extracting the parameters of the Standard Model, from experiments with less uncertainty, this work probes the limits of the Standard Model and therefore expands our understanding of nature’s building blocks. Those efforts are made challenging by the difficulty of calculating quantities in quantum chromodynamics. Some theorists working in this area refer to themselves asphenomenologists and they may use the tools of quantum field theory and effective field theory. Others make use of lattice field theory and call themselves lattice theorists. Another major effort is in model building where model builders develop ideas for what physics may lie beyond the Standard Model (at higher energies or smaller distances). This work is often motivated by the hierarchy problem and is constrained by existing experimental data. It may involve work on supersymmetry, alternatives to the Higgs mechanism, extra spatial dimensions (such as theRandall-Sundrum models), Preon theory, combinations of these, or other ideas. A third major effort in theoretical particle physics is string theory. String theorists attempt to construct a unified description of quantum mechanics and general relativity by building a theory based on small strings, and branes rather than particles. If the theory is successful, it may be considered a “Theory of Everything”. In principle, all physics (and practical applications developed therefrom) can be derived from the study of fundamental particles. In practice, even if “particle physics” is taken to mean only “high-energy atom smashers”, many technologies have been developed during these pioneering investigations that later find wide uses in society. Cyclotrons are used to produce medical isotopes for research and treatment (for example, isotopes used in PET imaging), or used directly for certain cancer treatments. The development ofSuperconductors has been pushed forward by their use in particle physics. The World Wide Web and touchscreen technology were initially developed at CERN. Much of the effort to find this new physics are focused on new collider experiments. The Large Hadron Collider (LHC) was completed in 2008 to help continue the search for theHiggs boson, supersymmetric particles, and other new physics. An intermediate goal is the construction of the International Linear Collider (ILC), which will complement the LHC by allowing more precise measurements of the properties of newly found particles. In August 2004, a decision for the technology of the ILC was taken but the site has still to be agreed upon.